This is Day 22 of our 31 Days of Less & More challenge. To read all the posts in order, start with Day 1, then visit the Overview Page to see the entire series. What is the deal with all that paper? Between the junk mail and the non-junk mail, the endless stream of schoolwork and flyers and newsletters and Sunday school handouts, of schedules and invitations and notes and lists…..I don’t know about you but sometimes I feel like we are drowning in a sea of paper. You would think, in the year 2013, with all the electronic everything and the ever-increasing emphasis on the importance of being green that less paper wouldn’t even be an issue anymore. But in our family, paper is most definitely still a problem! Based on the number of requests I have gotten about doing a post on how to deal with paperwork, I don’t think I am alone in this struggle. Toss it as soon as you can. I have found that the most helpful strategy when it comes to incoming paper is to throw away (or recycle) as much as I can, as quickly as I can. This means that junk mail goes straight to the trash from the mailbox, and that most school & church papers are quickly scanned then tossed the minute we get home. Pile it now, sort it later. My husband likes piles; I do not. In order to find a system that worked for both of us, we eventually agreed on contained piles for certain things, that could be piled as needed, then tossed or filed later. For the girls’ school papers, for instance we have two wire baskets that we can use to pile any papers or artwork that we may need to look at later, or might want to save. We always know where to look for the information, and then once a month or so we go through and toss anything that is no longer needed. We keep similar piles for important paperwork or projects. File, file, file. For all other paperwork we create files which are then neatly stored in file boxes. Once a year we will move current files into archived file boxes that get moved to storage. Be sure to read Edie’s corresponding post, More Filing. Tame that paper mountain that is threatening to take over your desk or countertop right now. Give yourself an hour to tackle your piles. Ruthlessly toss anything that isn’t necessary. Use your phone to take pictures of invitations or other important events, add them to your calendar, then toss the paper copy. Start a file box, if you don’t have one already, for the paper items you do need to keep. Establish an inbox and outbox to replace the piles you would normally make. 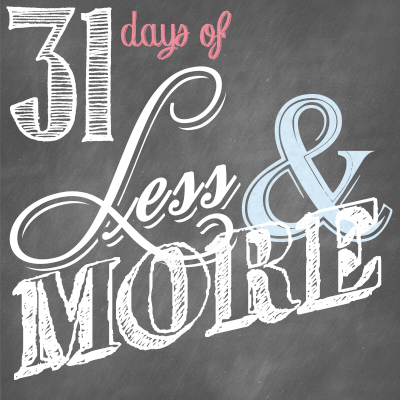 Share before/after photos with us on Facebook or Instagram under the hashtag #31DaysLessMore! 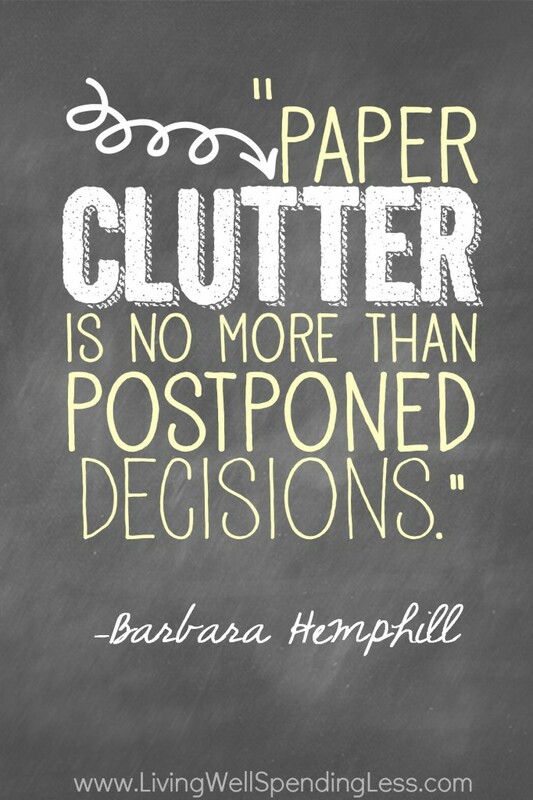 How do you deal with all the paper clutter in your life? I try and have all of the bills come electronically and file them in my email. As for the paper clutter that comes into my house, I try and keep up with the filing system: file, throw away and shred. It’s a pretty simple system, keep the important documents, shred the old important documents, throw away junk mail/plain stuff. I do a sweep of our house every week to catch the strays and go through the shred pile as needed. Follow the OHIO method: Only Handle It Once. I adopted this in my teaching career this year and would like to say I’ve become more efficient and organized! I’m good about sorting through mail before I even bring it in the house, as my recycling bin is in the garage. However, piles do seem to take too long to be sorted at times, and since we don’t have a desk in our house, the kitchen table is the place for those piles. Sigh. Like you, Ruth, I’m constantly working on improving my system! The best advice I ever received when my 4 kids were still at home was to put together a file system of folders. I had 12 folders, one for each month of the year and then 31 folders, one for each day of the month. Everytime I got a school paper or something in the mail that didn’t have to have immediate attention but needed to be looked at later, I’d file it in the folder for a later date. If it was a wedding invitation, for instance, I’d file it in the appropriate month to be dealt with later. Each day I’d open that day’s folder and deal with those items. On the last day of the month, I’d open the next month’s folder and file items according to the day they needed to be looked at. I found magazine holders at IKEA that the folders fit into neatly and that box stayed in my kitchen. It was so nice to find that field trip notice on the appropriate day, sign it and put it in the backpack on the spot. This system saved me so much mind clutter! That sounds like a great system Mary! Grrr…paper is my arch enemy and it seems to be winning the battles and the war! I have made several files…most of which never see the light of day again once they are filed. I have magazines that have been waiting for me to go through them & file the good stuff for several years. And oh, it is much too easy to hit the ‘print’ button when I see good recipes on the internet and my pile of unused, unfiled recipes keeps growing and getting more out of hand. I don’t seem to be having this type of trouble in any other area of my homemaking…just with paper. I thank you for your post and am hoping there is still hope for me to master my piles of paper!